Jonathan Chait notes that recently the Obama re-election team has said it will put money into Texas, and observes that this is part of a bigger strategy. In the narrow analysis, Texas is a deeply Republican state. Obama lost it by a dozen points in 2008. It can’t possibly help him win in 2012. If he does win the state, which could conceivably happen only in some kind of blowout scenario, he’d easily have enough electoral votes elsewhere to win. However, there is long-term potential in Texas. The Latino population there is as large a proportion as in California, but it’s heavily demobilized. A concerted campaign to register Latino voters could eventually change the dynamic. The catch is that you have to be willing to spend $20 million or so in order to register them — a huge investment that is hard to justify short term. But Obama might have enough money in 2012 to spare for a long-term investment. And a high-profile Latino Senate candidate like [Gen. Ricardo] Sanchez could lure a lot of previously unregistered Latinos. The only way to make this work is to create an energizing atmosphere for Latinos. What’s more, Obama does need to mobilize the Latino vote in general, especially in states like Colorado, New Mexico, and Florida. That’s where the immigration push comes in. Obama failed to pass immigration legislation because a coalition of Republicans and red state Democrats killed it. Because the bills never had a high profile vote, though, it looked a lot like Obama simply didn’t care. That’s why Democrats are making a high profile push now. Obviously, passing something is the best case scenario. But if Republicans want to kill comprehensive reform or even the very modest DREAM Act, the point is to make them do it in a high profile setting that clarifies just who killed it. That kind of clarification is necessary to make the mass mobilization they’re planning in Texas effective. You can’t carry out a mass registration campaign in an atmosphere where the stakes are perceived to be low. So the plan is to make the long-term investment in registering Hispanics in Texas, hastening the state’s eventual turn to purple, while maaaybe getting a competitive Senate race (Sanchez is a general running on a centrist message) and helping mobilize Latino voters in true swing states. Add it all together, and three decisions that make little or no sense on their own suddenly make a great deal of sense. It should be noted that one of the gifts the Republican supermajority has given us this session is a requirement that voter registrars must themselves be registered to vote in Texas, meaning that voter registration drives that depend on out-of-state volunteers are a no go. Be that as it may, the Trib’s Ross Ramsay asked his squadron of political insiders how they thought Obama would do in Texas in 2012 compared to 2008, and the response was overwhelmingly “not as well”. Assuming Team Obama is serious about contesting Texas, or at least competing in it, one of these viewpoints is wrong. How do you resolve the question? I look at it this way. 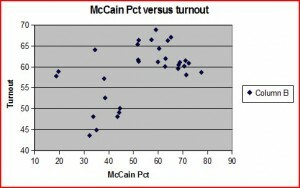 Obama polled pretty consistently in the 38-42% range in 2008, with John McCain hovering around 50%; the gap between them was usually eight to eleven points, not too far from the actual 12 point difference. I haven’t seen any poll numbers for Texas since the 2010 election. It’s possible they’ll show a noticeable drop in support for him, and if so I’ll have to reconsider. 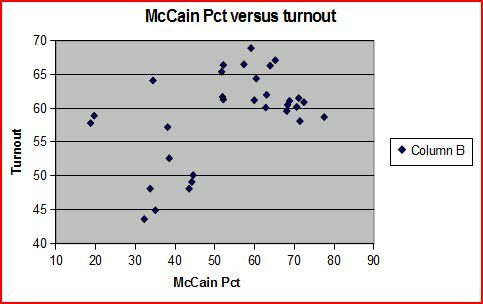 My suspicion is that there’s only so much more that Republicans and Republican-voting independents can hate him, and unlike in an off year there’s no large reserve of semi-habitual voters to show up and skew the turnout models. Based on demography and voting habits, I think he has a lot more room to go up than to go down. Spanish Surname Voter Registration (SSVR) isn’t an exact measure of Latino voters, but I think the point here is obvious. 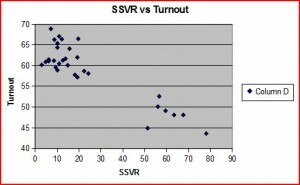 The seven most heavily Latino districts – SDs 06, 19, 20, 21, 26, 27, and 29 – had by far the worst overall turnout. Only SDs 19 (50.1) and 26 (52.6) cracked the 50% mark. 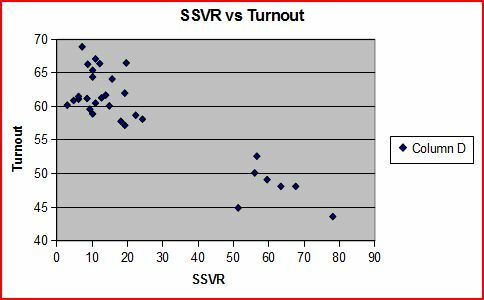 The district with the highest SSVR, SD27 at 78.1%, had the lowest turnout at 43.6%> Remember, this is turnout of registered voters, not population or voting age population or CVAP. Get these turnout levels up near the other districts and see how much you can cut the gap. Is it enough for a win? Highly unlikely. Is it enough to make the Republicans sweat a little and have some good effects downballot? For sure. All this is predicated on Obama’s approval level remaining about where it has been among Democrats, and him doing as well or better among Latinos in 2012. The latter clearly needs some work. I don’t know how well this strategy – assuming it is a real strategy, and not just the product of a writer’s imagination – will perform, but I’d like to think there is a strategy. We’ll see how it goes from here. question the Dem party belief that the immigration issue is the key issue as to whether Hispanic Americans will get out and vote. Jobs and the economy seem to be the key issues.